Dubai, UAE, August 06, 2018: Coffee tables have been a focal point of any living room for years. This piece of furniture is put to a myriad of uses every day. It can be used as a display for a fresh set of roses or an enticing book. A well-designed table can complement the look and decor of the space. However, choosing the right table is the first crucial step. A coffee table reflects the owner’s style and choice. Home and Soul Dubai, a lifestyle concept store, consists of pieces from destinations dotted around the globe that are simplistic, yet carefully considered and defined. 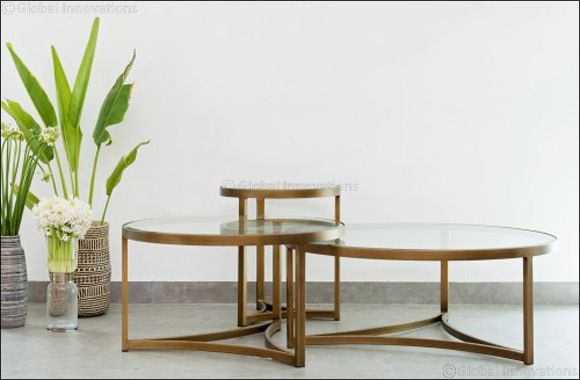 They have recently launched a new set of bronze embellished coffee tables starting from 1,600 AED. These can leave any room feeling sophisticated and well put together. With items being on the same eye level, the table looks short leaving most of the decor quite concealed. To create a more eye-catching vignette, have a variety of heights displayed. Add tall accent pieces that will create visual interest. Adding an orchid or tapered candle will help to do the trick. Compositions work beautifully when displayed well allowing for a soothing structure. Green creates the perfect aesthetic for any table. A low maintenance plant in the center of any coffee table will help accentuate any room highlighting the table. Set it right in the center for an organic, fuss-free way to bring life into your space. The natural decor will add soothing neutrals in the place. Creating an organic setting will help imbibe that natural element. Whether sea shells, cuttlefish or hand woven bowls they will all help create a fresh aura around the area. Using a few large books topped off with a decorative item will do the trick. Whether the latest magazine or and architectural digest they complete the norm of both aesthetic and use. Stacked books help provide a definite structure to any flat surface. Home and Soul provides a place beyond shopping - it is a place to meet, a place of inspiration and a place to enjoy.